Women's History Month is held annually in March to highlight the contributions of women to events in history and contemporary society. Up2Us Sports works with five female ambassadors who have all made their mark on their respective sports, and each hold a small - or in some cases, large - piece of history. The 6th annual event welcomed celebrities and pro athletes to Guastavino’s in NYC, raising more than $400,000 which will go towards training coaches in sports-based youth development and placing them in under-resourced communities. Nearly 100 people gathered at Baruch College in New York City for Hoop From the Heart, a 3-on-3 charity basketball tournament to honor Jay Katz. Katz passed away in 2012 from heart disease, and his daughters, Jennifer Kaplan and Rachel Katz, wanted to honor the love their father had for the game of basketball. 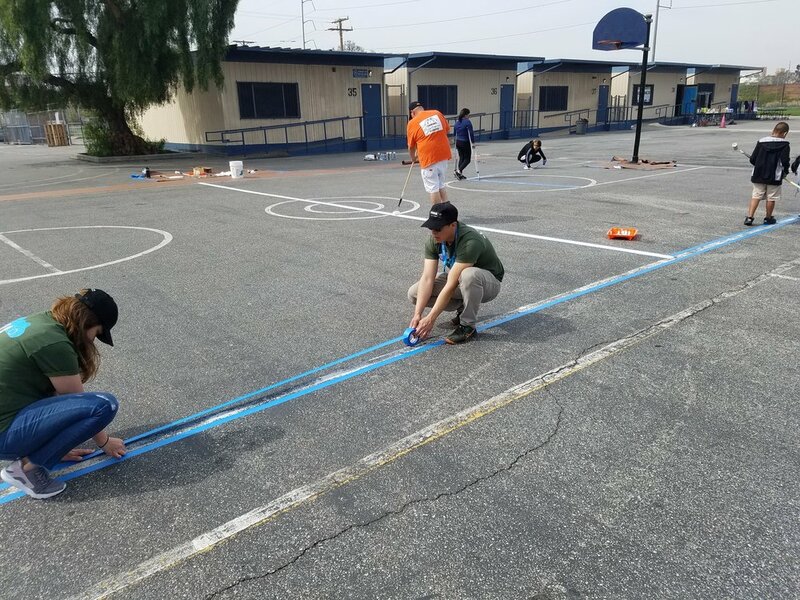 Earlier this spring, Up2Us Sports partnered up with Woodcraft Rangers on a Community Beautification Project at Oak Street Elementary School in Inglewood, California. Approximately 60 volunteers (including roughly 40 current Up2Us Coaches from the Southern California area) took part in the event and provided the school with a little TLC. Volunteers were greeted started rolling in to the school at 9:00am and were greeted with coffee and bagels at check-in. In true Up2Us Sports fashion, games of foursquare were played by volunteers during the check-in period as a way to reconnect and have fun. Once the check-in process came to a close, the volunteers gathered to hear the objectives for the day and were thanked for their participation by the event’s organizers. Various teams were created to sand and paint doors, repaint basketball courts, paint murals, and paint benches and a large wall in the playground area. Each team hit the ground running and dove right into each of their tasks accompanied by music booming down the halls played on Bluetooth speakers to keep everyone engaged. As the afternoon approached, the school had undergone a substantial transformation. Fresh coats of paint adorned an entire wing of classroom doors while the basketball courts displayed a revitalized look. The benches and wall also no longer looked worn and appeared to have a second lease on life with a new navy blue tint. Logos of each Los Angeles area professional sports team were plastered on the classroom walls facing the basketball courts. These logos are significant given that many young people in the Southern California idolize many of the teams represented on the wall and due to the fact that sports are at the heart of the work that Up2Us Sports does in the community. Once lunch had wrapped, volunteers came together in the playground area to take in the murals and share some high fives before calling it a day. Up2Us Coach Marysol Flores shared her thoughts on what motivated her to participate in the project. “It’s always great to show up for the Up2Us Sports organization because everyone really just comes together and puts their best attitude forward and it’s great to all work toward one cause,” she explained. Many other coaches echoed Flores’ sentiment and genuinely seemed pleased to reconnect with some familiar faces from the Up2Us Sports family while having a positive impact on their community. Spin To Break the Cycle on April 7th to Support Youth in Chicago! Spin to Break the Cycle takes over the iconic House of Blues Chicago uniting individuals, corporations and the greater Chicago community as together we help break the cycle and invest in the future of Chicago’s youth - creating stronger, safer, and healthier communities. See what AmeriCorps members serving through Up2Us Coach and AmeriCorps VISTA have been able to accomplish during their service terms. 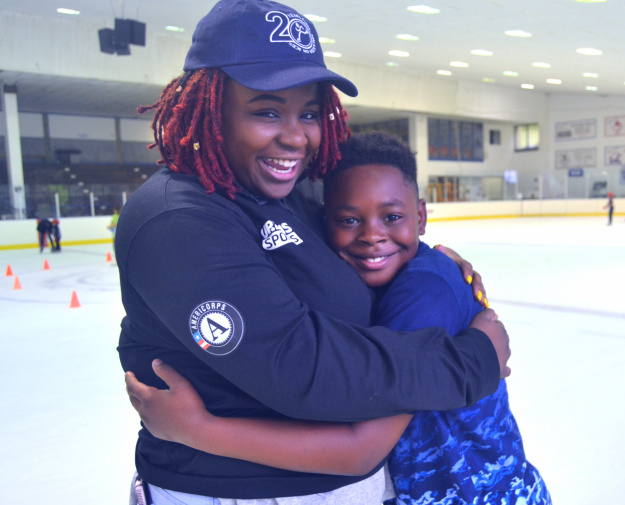 Since the inception of Up2Us Sports, AmeriCorps has been by our side, providing grants to support service members to serve as youth sports coaches nationally. These members, play pivotal roles in the lives of youth in and around some of America’s most underserved communities.